The pure aroma of Tahitian Gardenia will send your senses wild. Indulge in the pure sweetness of Gardenia infused coconut oil that lingers with every application. Spoil your body, Tahitian Gardenia has been known to improve emotional outlook and rejuvenate dry, brittle, and frizzy hair. Aromatically moisturize the skin or use as a natural perfume…you choose! 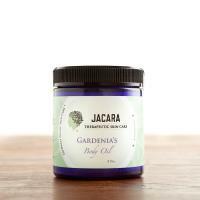 Ingredients: Gardenia taitensis (tahitian gardenia), cocos nucifera organic and natural (coconut) oil.